I've used this video vignette in the past for presentations and trainings, and recently have had many requests to share it. Click on the "play" button below to see a hilarious version of "relay interpreting" from an I Love Lucy episode. Enjoy! Yet another writer has expressed an interest in the From Our Lips project! 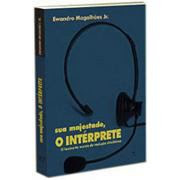 Ewandro Magalhães Jr., the author of SUA MAJESTADE, O INTERPRETE: O Fascinante Mundo da Traducao Simultanea, was kind enough to send a copy of his book to me, the only book ever written on this specific topic in Portuguese. His book is now being translated into English as well. To read more, or to order a copy, click here.